A gorgeous way to keep your loved ones close, this silver butterfly hand print necklace holds the true prints of your loved ones. 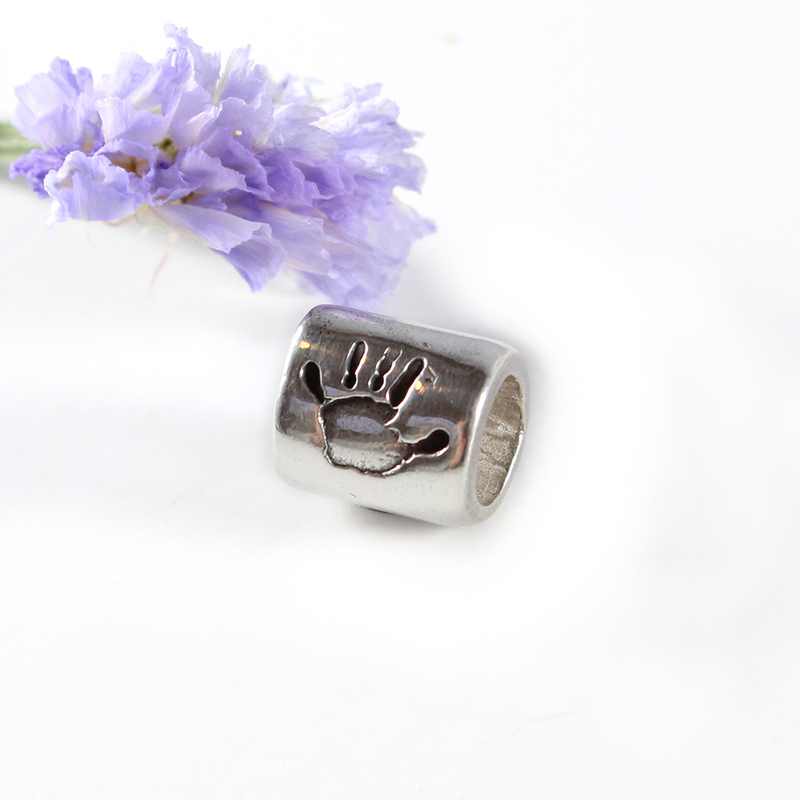 Hand print jewellery is a perfect gift and keepsake for so many occasions. A gorgeous silver butterfly hand print necklace holding the real hand prints of your loved ones. You could also choose for your silver butterfly necklace to hold foot prints or maybe a pet’s paw prints! It is a beautiful way to keep your loved one’s close. Each silver butterfly necklace holds 2 prints and is made from solid fine silver with a sterling silver chain. The total length of the necklace will be 18 inches. However please let me know if you would like it slightly shorter or longer as I make the butterfly necklace and can easily adjust the length of your butterfly hand print necklace! The silver butterfly hand print necklace measures 3.6cm from wing tip to wing tip. 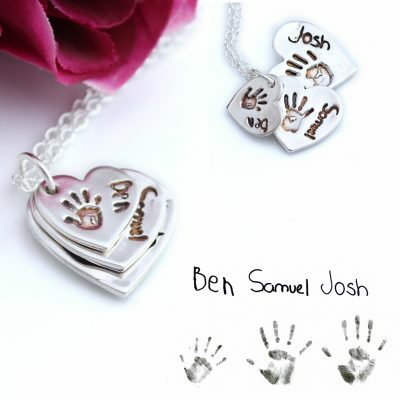 All Impressions to Keep hand print jewellery can have names engraved on the reverse and this is free of charge. As the prints are scaled down in size to fit on to whichever size of hand print pendant you choose, we can work with prints from any age; new born to 90! 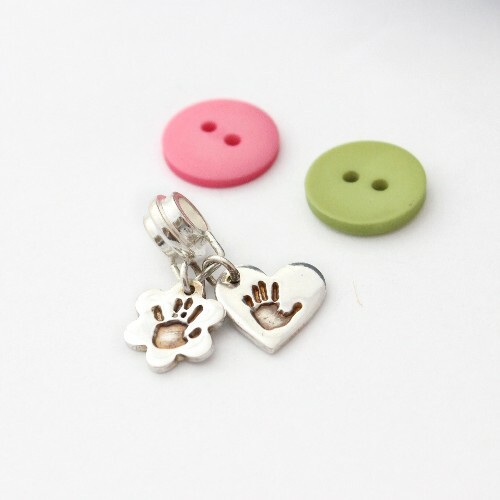 The same hand prints can be used for several pieces of hand print jewellery. You can select to have your prints inlaid with 24ct gold, creating a stunning contrast between the silver and gold metal and beautifully accenting your prints on your hand print necklace. Upon placing your order for your silver butterfly hand print necklace ‘kit’ to capture your prints in the comfort of your own home. The kits are very easy to use and full instructions will be included. Order forms and information for the return of the prints is included in the kit. If you already have prints you wish to use, Impressions to Keep will contact you to explain how to send them. 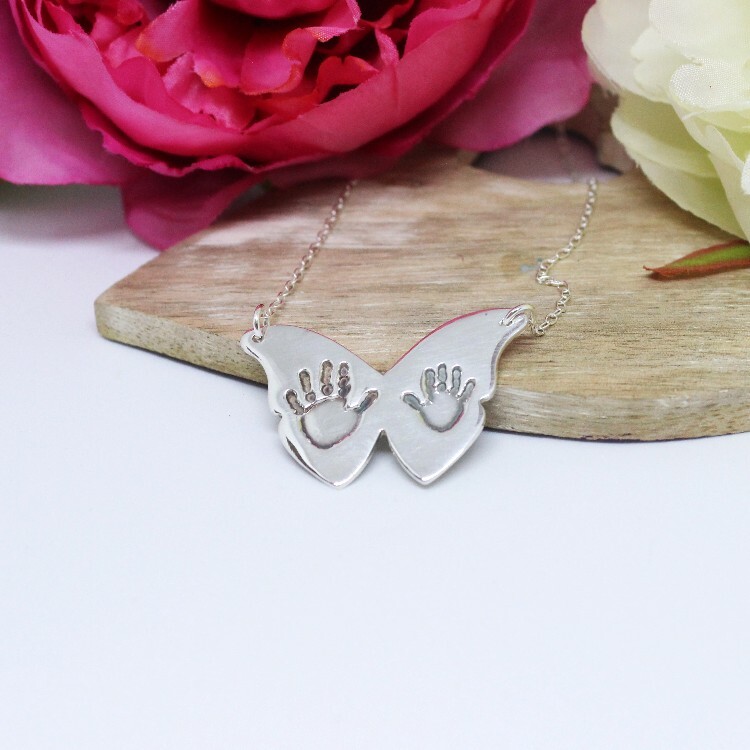 If you have any questions at all about the silver butterfly hand print necklace or any of the hand print jewellery, please use the ‘contact me’ form and I will do my best to provide the information you need as quickly as possible. Delivery of your silver hand print jewellery will be approx 3-4 weeks after Impressions to Keep has received your prints. It is sometimes possible to speed up the delivery of hand print jewellery, but please do chat to us to ensure it is possible ahead of placing your order.